This installment of the Monster Menagerie-series clocks in at 27 pages, 1 page front cover, 1 page foreword, 1 page editorial, 2 pages of SRD, leaving us with 22 pages of content, so let’s take a look, shall we? Well, before we do, let me please come clean: I *LOVE* aboleths – the wonderful blending of Lovecraftian tropes and body horror they represent resonates with me. Alas, since Lords of Madness, there hasn’t been much spotlighting of these great creatures. So let’s take a look at the horrors herein! Number one would be the Cr 16 Behemoth Aboleth – a gargantuan, living siege engine bred to destroy ships. These big guns of the aboleths come with a barbed hide and the capability to rend ships – and they are pretty neat creatures…though I kind of wished their barbed hide would also help against natural attacks. On a nitpicky side, the statblock has some SPs bolded that shouldn’t be and two of them lack hyperlinks, while the other have it – but I’m not going to penalize the book for this. The CR 8 aboleth engulfers are ray-like creatures that can spread their wings over targets – once again, a neat foe; on the nitpicky side, one ability deviates from the formatting established before. The CR 10 manipulator aboleths are interesting – they not only get full spellcasting, they also can freely combine spellcasting and tentacle/arm-attacks. Slime Golems (CR 8) are fish-like creatures made from aboleth mucus – they can swallow adversaries, change shapes and swallow creatures into their slimy forms – they come with full creation-info. The CR 17 Livyathan, kind of draconic, receives a powerful fear-aura and the option to fire a breath weapon of slime, which, underwater, may congeal into jellyfish swarms. Muculent Husks would be undead creatures that not only get an aura that taints water, they also get a fear-gaze and desiccating strikes. At CR 3, the degenerate protoaboleth, more parasite than mastermind, provides a nice low-level challenge and at the same CR, we get a cetacean variant of skum. 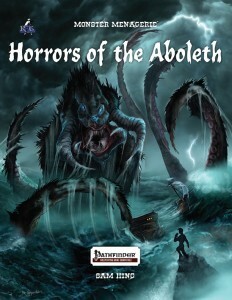 Larval aboleth swarms can also be found in these pages, as can the CR 10 Tentacle Crabs. On the supplemental side, we get mucus bombs, flesh hardeners and specific fish-like objects that can emit aboleth slime in jets. Magic-.item wise, a ring to facilitate landwalking and a staff with an aboleth-tentacle complement this book. 3 feats for skum-infiltrators, aboleth magi and humans fighting them are part of the deal – they’re okay, but ultimately nothing to write home about. The pdf closes with 3 new spells – and here, we get nasty ones: Slashing waves, skum-transformation-curse and an inverse vortex all have in common that they’re kind of awesome and deliver neat visuals to boot. Editing and formatting are good, but not as refined as usual for Rogue Genius Games-books. The pdf’s layout adheres to a GORGEOUS (no, really: GORGEOUS!) two-column full-color standard and the pdf comes with artworks…MANY artworks. And, quite frankly, they’re among the best I’ve seen in any 3pp. See the cover? Yes, the interior artwork is that level of awesome. Artist Bob Greyvenstein delivers art of Paizo-Plus-level quality and, quite frankly, at the low asking price, this book may be worth getting for the art alone. The pdf comes fully bookmarked and hyperlinked, though the latter are somewhat inconsistent. You can get this beautiful pdf here on OBS and here on d20pfsrd.com’s shop!